13 passionate songs of anger and hope that have elements of folk and world music but that also rock with amp rattling intensity. Lyrically this is where we meet Eastern hearts and minds, in Western streets and suburbs. Phil Monsour is an “Australian troubadour who sings songs of hope, humanity, invasion and occupations” (Limelight Magazine Jan 2009). He is a committed independent singer/songwriter with a history of producing music that travels beyond the mainstream to explore complex issues of identity, solidarity and politics. Phil's songs speak with honesty and insight about people’s lives and personal experiences. Based in Brisbane Phil Monsour has extensive performing and recording experience as a solo performer and with his bands, the Phil Monsour Band, the Cutters and Popproperly. Recent releases include the Empire’s New Clothes (2008), Live at Ahimsa House (2010), Lies and Silence (2009), and the Smart Bombs EP (2001). With the band Popproperly, Phil released two albums: Popproperly (1999) and Faint Blue Glow (1998), as well as a number of EPs and singles. Renowned for their high energy folk rock performances, Popproperly toured extensively through Europe performing at summer festivals, pubs and clubs in Germany, Holland, Ireland, Belgium, Sweden and Finland and built up an independent touring circuit undertaking 5 separate tours. In 2010 Phil Monsour participated in the Union Aid Abroad-APHEDA study tour to Lebanon and Palestine and performed in a refugee camp in Beirut. Images and video from this trip, and other archival footage is often projected during his performances and this helps create a powerful context for some of the songs. Phil continues to use his music to support many community fundraisers. With his new band, Phil Monsour recorded and released a 13-song CD, The Empire’s New Clothes. The result described by Noel Mengel in the Brisbane Courier mail is “ the most passionate album of his career.....The Empire's New Clothes shows traces of his interest in folk and world music but also rocks with amp-rattling intensity on songs like the blazing One Step and the anthemic Sing Your Song". The album is a bleak and insightful statement, a unique mix of personal and related narratives about ordinary people whose stories and circumstance are ignored or pushed to the edges. Musically, The Empire’s New Clothes builds on Phil’s acoustic rock style and creates a contemporary and complex musical landscape. For the project, Phil worked with a range of musicians from a wide variety of musical backgrounds to develop arrangements and instruments that best supported the power and passion behind the songs. Musicians included Jon Lloyd on drums, Graham Jackson on guitar and vocals, Lachlan Hurse on bass, Lorne Gerlack on keyboards, Bryan Pearson on piano and organ, and the ever versatile Simon Monsour as producer engineer and occasional musician. In May 2009, Phil released an album of solo acoustic performances entitled Lies and Silence featuring acoustic recordings of new and older songs. 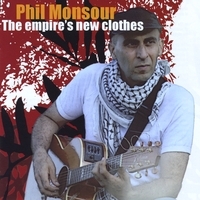 Since 2008 Phil Monsour has been performing regularly around Australia promoting The Empire's New Clothes CD. 20% of sales of The Empire’s New Clothes are donated to a development agency with projects in the Middle East.